First and foremost, Thank You for your kind support to MEIN Designers. Since lately we've been working hard to fulfil all inquiries during Ramadhan, now we present you the MEIN Last Minute Shopping event. This event is specifically designed for those who don't have spare enough time to shop last month. 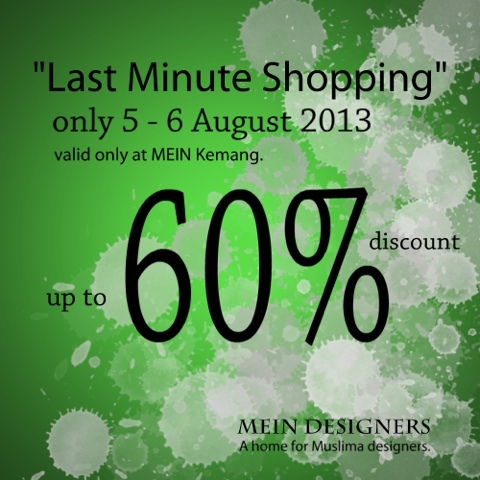 Last minute shopping will be valid only on 5 and 6 August 2013 at MEIN Kemang, after that we will let our staff to celebrate the holy Eid with their family. Please enjoy our latest Eid collection, and Minal Aidzin wal Faidzin, Mohon maaf lahir dan batin.